We created the Middleton Pick-N-Play app for use on both Android and iPhone. 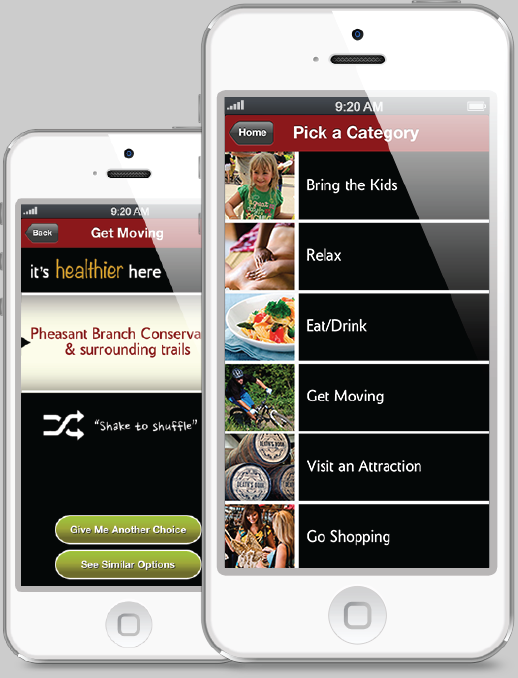 The app is a fun, easy way to plan the perfect day in Middleton. Users can pick from lists of fun things to do based on themes, from relaxation to kids activities. Can’t decide what to do? The Middleton Pick-N-Play app will give you some cool suggestions. The app is the ideal way to find the best places to play, stay, eat, shop and more. Have you tried your hand at running a Pinterest contest yet? It’s a relatively easy way to interact with followers in a very visual manner. In this week’s Link Friday, we’ve compiled some tips to help get you started. Pinterest recently updated their guidelines for running contests. Before you get started, check out the basic do’s and don’ts. Running a Pinterest contest can help you get more out of Pinterest. Here’s how. Reference these 7 tips to running a successful Pinterest contest when creating yours. Now for some successful contest examples. Check out 9 businesses that are using Pinterest contests to drive traffic and exposure. Finally, these 8 engaging Pinterest contests should help inspire you to create a Pinterest contest of your own. There isn’t one definitive way to run a Pinterest contest, so be creative! And hopefully these tips will give you some ideas for how to get your contest up and running.